The EIA reported this morning that working gas in storage was up 52 Bcf to 2.88 Tcf. The weekly injection was 41% below last year (+88 Bcf) but 8% higher than the five year average (+48 Bcf). The current storage level is now 25.5% above last year (2.294 Tcf, a difference of 586 Bcf) and 3.0% above the five year average (2.795 Tcf, a difference of 85 Bcf). Big jump in oil rigs this week as the total BHI U.S. rig count was up 19 to 876. Oil rigs were up 21 to 659, gas rigs were down two to 216 and miscellaneous rigs were unchanged at one. 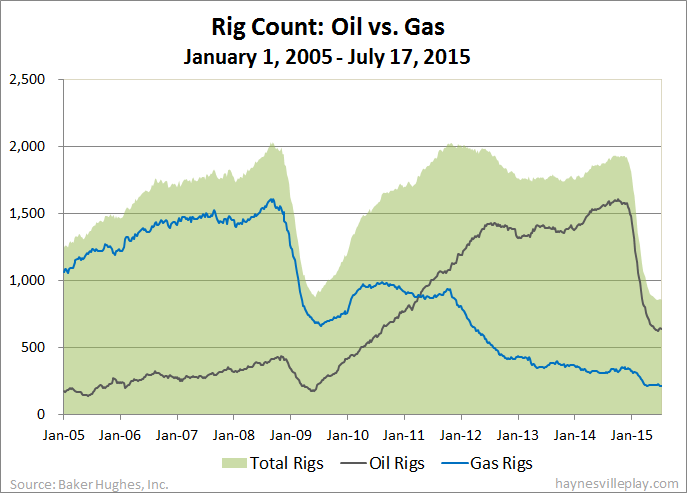 By type, horizontal rigs were up 12 to 662, vertical rigs were up eight to 131 and directional rigs were down one to 83. Among gas rigs, horizontal rigs were up two to 160, directional rigs were down three to 39 and vertical rigs were down one to 17. The EIA announced this morning that working gas in storage was up 61 Bcf to 2.828 Tcf. Because of a correction of previous data, the implied flow was 68 Bcf, but the actual difference from last week is 61 Bcf, so I'll go with that. The weekly injection was 34% below last year (+92 Bcf) but 15% higher than the five year average (+53 Bcf). The current storage level is now 28.8% above last year (2.206 Tcf, a difference of 622 Bcf) and 2.9% higher than the five year average (2.747 Tcf, a difference of 81 Bcf). Temperatures in the Lower 48 last week averaged 75 degrees, which was 1 degree warmer than last year and in line with the average for the week. On Wednesday, Penn Virginia Corporation announced that it had agreed to sell its East Texas properties to an undisclosed buyer for $75 million. The 33,400 net acres changing hands covers both the Cotton Valley and Haynesville Shale. Going forward, the company will concentrate its efforts on the Eagle Ford Shale. Personally, I find PVA's exit is a little bittersweet because they were one of the first companies to register a Haynesville completion way back when I started collecting them. Labels: Deals, Eagle Ford Shale, Haynesville Shale, Penn Virginia Corp. The Baker Hughes U.S. rig count was down six this week to 857. 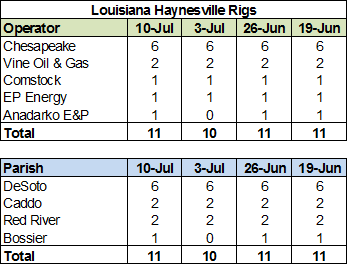 Oil rigs were down seven to 638, gas rigs were up one to 218 and miscellaneous rigs were unchanged at one. By type, horizontal rigs were down four to 650, vertical rigs were up two to 123 and directional rigs were down four to 84. Among gas rigs, horizontal rigs were down one to 158, directional rigs were down two to 42 and vertical rigs were up four to 18. In a not terribly unexpected move, Sabine Oil and Gas filed voluntary Chapter 11 bankruptcy today. This move sets up what might be an ugly fight in bankruptcy court as the debt holders from the old Sabine and Forest Oil get to face off against the company. During bankruptcy, the company expects to continue to operate on existing cash flow and cash on hand. The Baker Hughes U.S. rig count was up again this week, this time by one to 863. Oil rigs were up (for the second straight week) by five to 645, gas rigs were down two to 217 and miscellaneous rigs were down two to one. By type, horizontal rigs were down three to 654, directional rigs were down nine to 88 and vertical rigs were up 13 to 121. Among gas rigs, horizontal rigs were down one to 159, directional rigs were down one to 44 and vertical rigs were unchanged at 14. 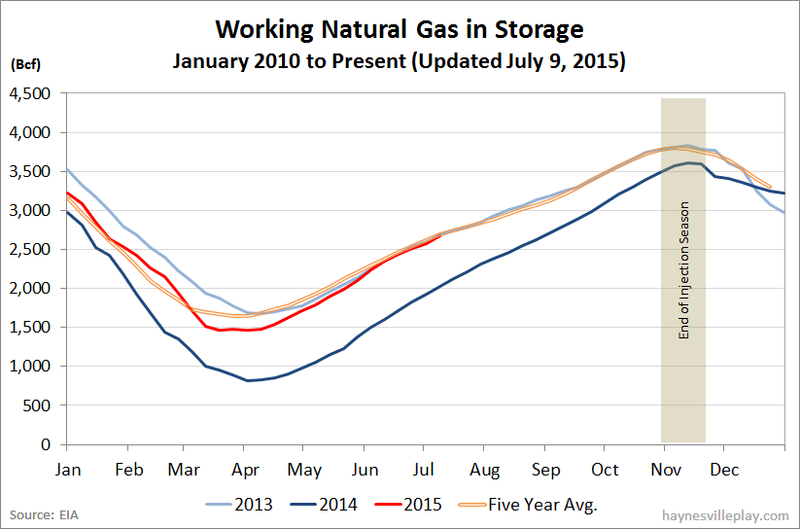 Pretty big injection this week: the EIA reported that working gas in storage was up 91 Bcf to 2.668 Tcf. The weekly injection was in line with last year (+94 Bcf), but 21% greater than the five year average (+75 Bcf). The current storage level is now 32.8% above last year (2.009 Tcf, a difference of 659 Bcf) and 1.7% above the five year average (2.623 Tcf, a difference of 45 Bcf). 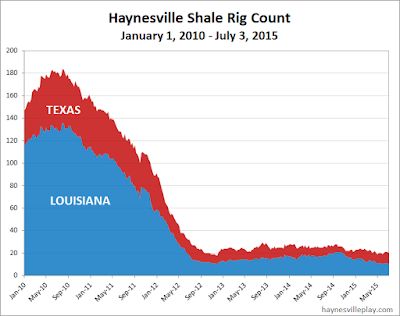 Over the past two weeks, the Haynesville Shale rig count was down one to 20. Louisiana was down one (Anadarko) to ten, while Texas held at ten. 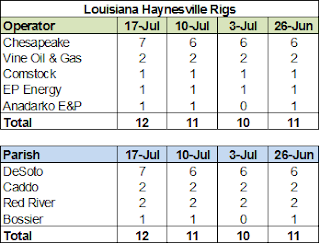 The Louisiana count is tied for the lowest ever since the Haynesville play started kickin', and this is the first time since the peak that LA has as few rigs as TX. Seems like old times: oil rigs up, gas rigs down! Oil rigs were up 12 this week to 640, while gas rigs were down nine to 219 and miscellaneous rigs were unchanged at three. This week finally breaks the streak of 29 straight weeks of declining oil rigs, a period when the rig count fell from 1,575 to 628, a decrease of 947 rigs, or 60%. 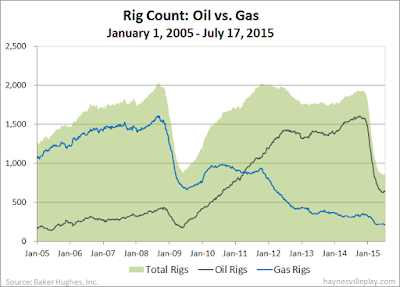 By type, horizontal rigs were up three to 657, vertical rigs were up one to 108 and directional rigs were down one to 97. Among gas rigs, horizontal rigs were down four to 160, directional rigs were down three to 45 and vertical rigs were down two to 14. The EIA announced this morning that working gas in storage was up 69 Bcf to 2.577 Tcf. The weekly injection was 32% below last year (+102 Bcf) and 8% below the five year average (-75 Bcf). The current storage level is now 34.6% above last year (1.915 Tcf, a difference of 662 Bcf) and 1.1% above the five year average (2.548 Tcf, a difference of 29 Bcf).